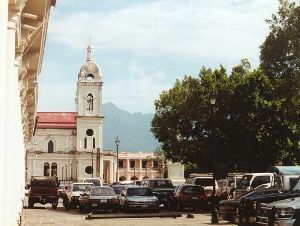 The town square, with Volcán Mombacho in the background, is not always used as a parking lot. Granada is a tourist favorite. I befriended an Italian man who has a hotel there who told me "one hundred people come to Nicaragua, one hundred people come to Granada" - which is why he set up his hotel there instead of in the much more wonderful León. Funny how the most likely tourist destination is the place least like the rest of the country. I didn't like it much. I went out on a parade day, even though my friend Martin had told me how he was nearly gouged by a bull the last weekend, at the beginning of the festivities for Granada's patron saint. There were no bulls being chased through the streets that day, but it was awful. I thought I'd get some good pictures, but after an hour of the madness I ran home & was grateful to sit around with the various teenage boys somehow related to my host family - with them asking questions in English & me replying in Spanish - drinking canned beer & watching tv (in English, by their choice, not mine). It is lovely, a very old city - as traditionally conservative as León is liberal. It shows its colorful, beautiful, violent Spanish roots. It has also been popular with the US. William Walker, a Texan who decided to go take over Nicaragua in order to cash in on the very popular route to San Francisco, ruled from one of the old churches in Granada. It is on the edge of Cocibolca, a lake so big that when the Spaniards first reached it they thought they'd found the shortcut to the Atlantic Ocean. There are sharks in it too, but you'd be lucky to see one. The view back to Granada from a nearby hill (with a big cross on top, of course). You can see the big white cathedral in the center & that's Cocibolca to the right. The lake was filthy along the shore. I walked along it one day with Martin, who was about to leave town & glad of it. 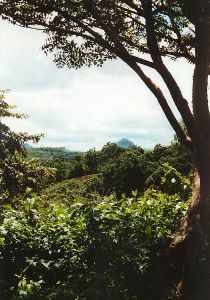 We were both enchanted by Nicaragua & at the same time deeply distressed by the condition of the land. Most of it was so ruined it was not even being used for agriculture. There was so much trash, really vile stuff, by the edge of the lake that I truly worried when I got my feet wet over my sandals. We are both the type to pick up trash as we're out admiring nature. That day we didn't know what to do. We each picked up a couple of things without thinking & then, at the sight of a needle & a big rusted spring wedged into the plants, we just stood in despair. Far from feeling self-righteous, we both felt responsibility for the state of the lake shore - on the part of our belligerent colonizing countries, if not our own. Even so, as we stood in that tragic place, we saw more birds & bugs than we could count. It was still very much alive, but we agreed that the life of those beautiful colorful birds was a lot better before Granada came along. The bird life in Nicaragua (except for big raptors, which are big enough to eat) is amazing. One of the most mind-boggling things I've ever seen was the parakeets living in the sulphur-spewing crater of the Volcán Masaya. It wasn't just the sight of them flying quickly by, but the experience of standing by the huge stinking whiteness & hearing the joyous cacophony of parakeet life taking place inside on the steep rocky cliffs. I got quite dizzy in the moments during which I stood near the toxic cloud. If the wind had changed & brought it toward us, we would have had to leave. The plants on the sides of the volcano are stunted from the acid rain that falls on them. Yet, the squawking parakeets were obviously doing quite well (not to mention being quite safe from humans) & a brief climb up from that spot in another direction brought us to another crater, filled with completely unspoiled forest. The "mouth of hell" the Spaniards called this crater of Volcán Masaya, protecting themselves from its obvious evil powers with a giant cross. From Granada I took a long bus ride (2) to Santo Tomás, Chontales. Once I had gotten through Managua & out into the middle of the country, it was a breathtaking ride. The land was covered in green, some of the rivers were even clean-looking. I laughed to think that I had told one teacher how much time I spent on rivers at home. Most of the rivers down there were not very pleasant to look at. The countryside past the big lakes, past where most tourists go, especially in the middle of the rainy season, is really beautiful. I was lucky to have an invitation to visit. The town is at the top of a cliff. 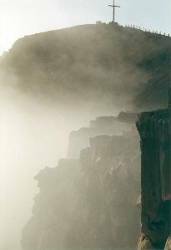 My family, Bob's family really (from the 2 months he spent there in '98), lives on a road that ends at the cliff. I spent quite a bit of time just standing by myself at the edge of the cliff, looking out into the soothing green. The women of the sewing cooperative had waited to open the suitcase I had carried from Olympia until I arrived. It was sweet that they gave me so much credit for the gifts when all I had done was carry them for one day. They were very excited about a package of personalized labels to put on the clothing they made. 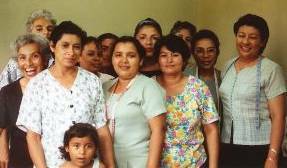 I worked with them, making school uniforms, for a few hours a day while I was in Santo Tomás. I didn't really know very many sewing words & they did not know English so I had to figure most things out for myself. The hardest thing was figuring out the different sewing machines, all old, all quirky, none like my gorgeous machine at home. I felt totally spoiled because of course they cheerfully turn out beautiful children's outfits with all kinds of fancy ribbons & pleats on machines that I would take straight to the repair shop at home. 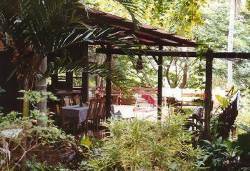 The most luxurious place I stayed in Nicaragua was the school at Laguna de Apoyo, Proyecto Ecológico. It is a small place (with a heated shower for cool lakeside nights! ), with a wonderful cook, which is both a school & a research station. It is run by a very entertaining man from Tennessee named Jeffrey, who also teaches at the University of Central America in Managua. I was very impressed with my teacher at Proyecto Ecológico. I had gotten discouraged with the other school because I felt that the teachers (except for Nubia) did not have training enough to be really useful for the more advanced student. I was a little reluctant to come to another school, but I had met Jeffrey while I was in Granada & he knew his most persuasive argument would be a visit to the school so he brought me down there for dinner. I knew it was a lovely place so I figured it would be nice even if the teacher wasn't very good. Jeffrey set me up with his best teacher, Bismark, a young man from the handicraft town of Masaya. He talked with me for hours about myths, politics & all the accidents of life, sharing as much with me as Nubia had in León. He made me work even harder at Spanish. He corrected me as we talked on & on about dreams, encouraging me never to rest without steering away from some very fascinating conversations. He made me talk to everybody who worked at the school, using the subjunctive. He made me ask Lorenzo, an almost redneck nica who spoke perfect Spanish in a very rough manner, about his ideal girlfriend. I can only say that I was quite embarrassed by his answer. On a boat ride out on the lake with Jeffrey, Lorenzo (who is Jeffrey's diving research partner) & another student, we watched a fire burning on the side of the cliff & although Jeffrey assured me it was a reserve he pointed out that "protected" isn't exactly the right word. Even so, we could hear that the howler monkeys were plentiful. The deck of the school, which is surrounded by papayas, guardabarrancas (the very colorful national bird) & pale green orchids. 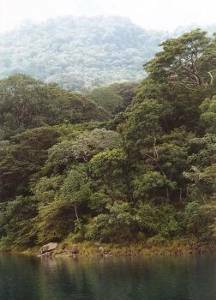 Laguna de Apoyo is a wildlife refuge, partly because its steep cliffs would not be easy to cultivate. On the way to Managua a couple of days before I flew out, we had an adventure getting a car that worked, then Jeffrey was stopped by a young policeman & talked his way out of a ticket (without getting sent to jail). It could have been very inconvenient, but I had time, a good place to stay & besides, I had no doubt that he would be able to talk his way out of it. I heard him arguing that the young officer obviously could not drive (or he would've had a better job), so how could he tell Jeffrey how to drive. He gave them a few córdobas & we went on. 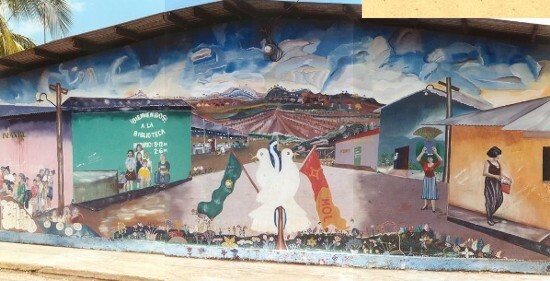 In Granada I had met a woman from Virginia who teaches at the international school in Managua. She saw my sandals & figured we would get along. She teaches the rich kids (conservatives & liberals) & was curious about the history & politics of the place because she was starting to get the idea that life had been better under Somoza. She was not offended when I told her she had gotten only one small piece of the picture & that she should get out more. She invited me to visit her in Managua. She was gone when I arrived, but had left me a key with the girls who ran the shop next door & also cleaned her place. It was a lovely, incredibly luxurious apartment. I guess it was the most luxurious place I stayed, but it wasn't by the lake, it was in Managua (anyway, León was by far my favorite). I didn't venture out much. I was happy when Vicky came home & we talked all day. We went out for dinner with another teacher & shared stories. Even though the two women were living in Managua for a year or 2, I felt that I had seen more in 2 months. Of course, Vicky has only been there for a few months & she is using her weekends wisely. Obviously she is braver than I am because if I had a gorgeous house in Virginia I wouldn't go live in Managua for a year or two. I was happy to come home . . . but that's another adventure.